Spring time is just about here and I am already preparing dishes that are perfect for this season, especially for a barbeque. I feel like I managed to put all of my favorite ingredients into this one salad like the fennel, balsamic, spicy mustard, kale and healthy Kelapo coconut oil! 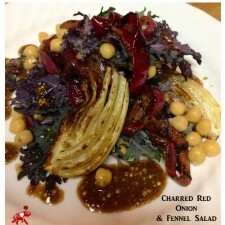 The combination is fantastic, and with the smoky char on the onions, there is so much flavor for the raw kale. Using the coconut oil is perfect because it can stand up to the high heat when browning the onions and fennel, and since the flavor is so subtle, it allows their natural sweetness to really come through. I added the chickpeas for a bit of creamy texture and protein, which makes this a substantial salad that can be eaten on its own, or accompany a dish like seared salmon or a pork chop. Marinating the onions takes a little preparation time, but it is well worth it! I hope you enjoy this salad as much as I do, I had to restrain myself from eating it all while I was preparing the recipe, so I am devouring the leftovers today and I can’t wait! Slice the onion into ½” thick disks and place in a pan with enough surface area to spread them out to marinate. In a small bowl, melt the ¼ cup of Kelapo coconut oil and whisk in the vinegar, mustard and rosemary. Pour the marinade over the onion slices and make sure to coat them on all sides. Cover the pan and set it aside for two hours to marinate. Using a large non-stick pan, melt the 1 Tbsp coconut oil. While it melts, lay the slices of fennel in the pan in an even layer. This will need to be done in two batches because of the amount of fennel. Allow the fennel to caramelize to golden brown, about 4 minutes, and sprinkle with salt and pepper as it cooks. Flip them over using a pair of tongs and repeat on the opposite side. As the pan heats up, they will brown faster, so lower the heat for the second batch. Heat a cast iron skillet, outdoor grill or grill plate to cook the onions. (Don’t worry if you do not have one of these, this can be done in a skillet as well.) Once the pan or grill is smoking hot, remove the onions from the marinade and cook, reserve the marinade to finish the salad. Rotate the onions to keep them from burning too much, but we do want them to blacken a bit and char, about 10 minutes. Season with salt and pepper while they cook and once they are charred and tender, remove from the pan and allow to cool for about 5 minutes. 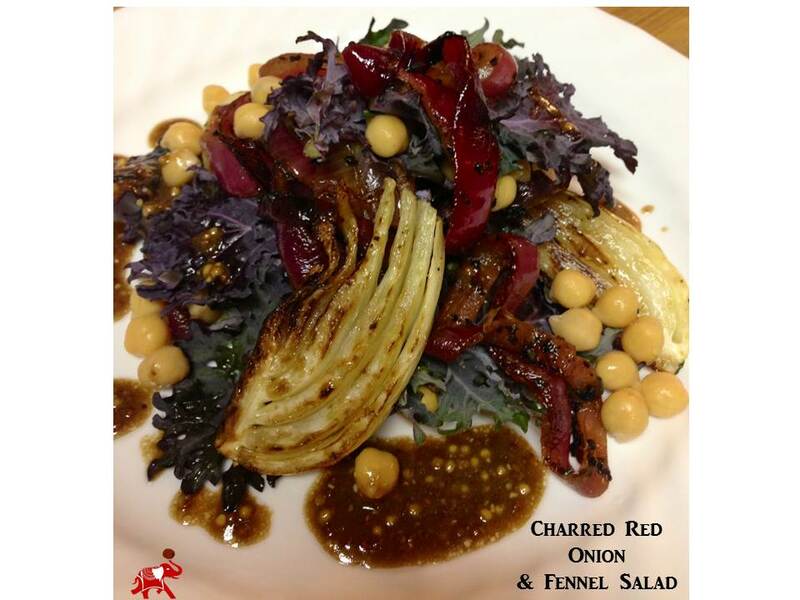 In a serving bowl or platter, arrange the warm onions with the caramelized fennel, kale leaves and chickpeas. Drizzle with the remaining marinade and enjoy!